The 2013 I2SL Annual Conference, formerly Labs21, brought the event for the first time to the upper-Midwest, adding many new faces to the growing I2SL Community. With these came new ideas, new opportunities, and a stronger commitment to the mission of I2SL. Also joining with many of our returning vendors in the tech fair, we welcomed a slate of new equipment manufacturers offering energy-efficient and environmentally-preferable lab products. The new vendors are a result of a strong push by I2SL to recognize that lab equipment must contribute to a laboratory's sustainability goals. Shaping guidance for the continuous improvement of a laboratory's energy and environmental performance. Third-party financing of energy efficiency projects in laboratory and related high-technology facilities. Developing a training curriculum for laboratory and related high-tech facility operators and managers. These working groups, and others, will continue to meet during the coming year, reporting progress at the 2014 I2SL Annual Conference. I, along with the I2SL Board of Directors, am heartened by the increasing interest of many in the I2SL Community to organize I2SL Chapters. Board Members met with many of you at the 2013 I2SL Annual Conference who expressed interest in joining or starting your own chapters, and we are anticipating receiving new petitions to launch additional chapters. I2SL's Windy City and Colorado Chapters are now established and well underway with their activities. The I2SL Board of Directors looks to its chapters to support a regional network, providing continuity between the annual conferences and promoting knowledge and expertise consistent with the mission and goals of I2SL. As we close out this year, I look forward to planning the 2014 I2SL Annual Conference in Orlando, Florida. I encourage you to engage with I2SL over the coming months to again make this event useful to all. With your help, I am sure it will be a success. I wish you all a wonderful holiday season. I2SL Thanks Its First 2014 Annual Conference Sponsor: Phoenix Controls. Join them and support I2SL through sponsorship today! Thank you again to everyone who attended the 2013 I2SL Annual Conference in Minneapolis! The strong attendance and more than 100 presentations helped make this year's conference a great success. If you haven't yet completed the post-conference evaluation survey, please take a moment to share your thoughts about this year's event. Conference presentations are now available online through February 14, 2014, for conference attendees. Please contact I2SL if you need access instructions. I2SL Members have year-round access to the presentations from all past conferences so if you're not already a Member, join today! Register today to secure a prime spot in this year's Technology and Services Fair. I2SL has also launched opportunities to sponsor the 2014 Conference. Options start at just $500, and the earlier your organization signs up the longer we can promote your sponsorship in conference materials. Show your organizations commitment to I2SL's mission and become a sponsor today! I2SL Members enjoy free access to a wealth of information available in Labs21 and I2SL Annual Conference presentations and recorded and upcoming I2SL High-Tech Talk Webinars; are given the opportunity to create, lead, and be voting members of I2SL Working Groups; and receive recognition at the I2SL Annual Conference. I2SL also plans to provide Members a registration discount for the 2014 I2SL Annual Conference. Are you missing out on these benefits? 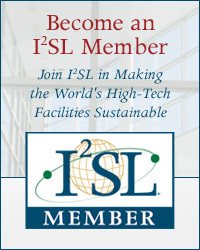 Become an I2SL Member today and you can start enjoying your share of benefits right away. Learn more and sign up today for your year-long membership! For current I2SL Members, we've made it easy to renew. You will receive an email reminder when your membership expires that will direct you to the renewal form. Simply enter your membership ID, found in your original Member confirmation email, or in the expiration reminder email, and the form will pre-populate with the contact information you previously submitted. You'll also have the chance to create a personal login for the Member Portal. I2SL Chapters help extend the reach of I2SL's network, training, and educational materials to regional contacts that might not be able to connect with I2SL on a national level. I2SL's Colorado and Windy City Chapters continue to meet regularly, providing laboratory and other high-tech facility professionals the opportunity to network, learn, and share information in a local setting. I2SL's Colorado Chapter had its second meeting in October. 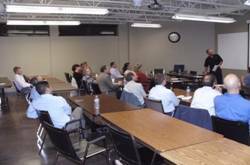 On October 24, the I2SL Colorado Chapter had a business meeting and presentation. The meeting sponsors, LONG Building Technologies and Air Purification Company, gave presentations over dinner. The chapter then had a brief business meeting to report on the 2013 I2SL Annual Conference, the benefits of membership, and current fundraising efforts. The featured presentations were “Improvements to Indoor Air Quality for a High-Rise Laboratory Facility Including a Vivarium” by Sean Convery, Cator Ruma & Associates and “Jennie Smoly Caruthers Biotechnology Building Case Study” by Matt Meyer, JE Dunn Construction. Contact the I2SL Colorado Chapter if you are interested in joining. Performance Contracting: A Path toward Sustainable Facility Design and Operation was the topic of the I2SL Windy City Chapter's second meeting. The event consisted of laboratory and hospital case study presentations followed by a panel discussion. Presenters and panel participants included chapter president Marvin Kirshenbaum, Argonne National Laboratory; and chapter vice president Vy Milunas, University of Illinois at Chicago; and as well as representatives from Johnson Controls, Inc., Siemens, Energy Systems Group, and Ameresco. The room was filled to capacity and the audience of 43 enjoyed a lively discussion. Contact the I2SL Windy City Chapter if you would like to become a member. Contact I2SL to learn about our soon-to-be-chartered chapters (we expect to charter a New England Chapter before the end of the year!) or to inquire about starting a new chapter in your region. I2SL's Laboratory Continuous Performance Improvement Program (LCPIP) Working Group met on November 19 to consider next steps for the LCPIP. The working group is focusing on a strategy that includes various user activities. This strategy—initiated by Allen Doyle from the University of California, Irvine—might serve as the structure for the LCPIP. A number of working group members volunteered to lead sub-committees to develop guidance for the various user activities identified as part of the LCPIP strategy. I2SL Members are encouraged to join this working group to contribute to this tool. If you are interested in joining, please contact I2SL. During the 2013 I2SL Annual Conference, the Alternative Financing Working Group (AFWG) held both a meeting and early bird session to discuss the common characteristics of successful alternatively financed projects and best practices. 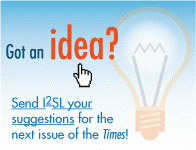 I2SL invites working group members and others interested in this topic to continue the discussion in 2014. The AFWG—organized by I2SL in collaboration with the U.S. Department of Energy's Federal Energy Management Program (FEMP)—will kick off 2014 with a free webinar and open discussion for energy service companies (ESCOs), utility energy service companies (UESCOs), equipment manufacturers, architects, and engineers. The webinar, "Successful Third Party Financing for Capital Improvements in Laboratories, Hospitals, and High-Tech Facilities: Lessons Learned by the Alternative Financing Working Group (AFWG)" will take place in January. Information on the webinar date and time will soon be available and sent to I2SL's network. Stay tuned! Create a shared service center for UC's wholesale electricity supply, offering flexibility to develop alternative energy sources. Continue efforts in campus efficiency and renewable energy. Manage natural gas purchases and develop renewable natural gas, or biogas. Work toward carbon neutrality through UC's management of environmental attributes, including soliciting funds to support initiatives. Specific strategies will vary among UC's campuses and projects, but all will contribute to UC's plan to become to first major university system to reach carbon neutrality. UC President Janet Napolitano remains confident: "[R]esearch universities like UC are in the business of breaking through barriers. That's why we call them breakthroughs. It is the essence of what research universities do." More information about this initiative can be found on UC's sustainability page. 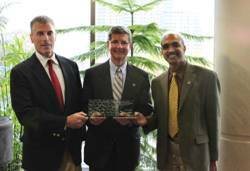 Andrew Berki (left) and I2SL Member, Dr. Sudhakar Reddy (right), receiving an award from Dan Wyant (MDEQ Director). As a direct result of this program, the University of Michigan has made progress toward two of its sustainability goals: to reduce greenhouse gas emissions and reduce landfill waste. Is Your Lab a Lab of the Year? Do you know of a lab leading the way in innovation and efficiency? Then you should consider submitting it to the 48th Annual Laboratory of the Year competition, which is now open for entries. Evaluating lab facilities on their planning, design, and sustainability, this international competition recognizes the best new and renovated labs and efforts to transform their space into an exceptional work environment. All entries, including renovation projects, are in equal consideration for the traditional Laboratory of the Year Award. Additionally, this year's awards include several distinct categories, including the Renovated Laboratory of the Year Award, the Adaptive Re-use Award, and the Fit-Out Award. The deadline is January 31, 2014. For further details on eligibility and registration, please view the complete list of entry instructions. In July, Gilbane Building Company released its summer 2013 Construction Economics report. This report includes trends and indices for the construction industry, including information about education and healthcare facilities. The full report is available in I2SL's E-Library. Be sure to check out the E-Library for this and other important resources related to financing, specialty laboratories, and sustainable architecture. Watch for the December 2013 issue of Laboratory Design Newsletter, which will feature select extended abstracts from the 2013 I2SL Annual Conference. The Call for Presenters for the 2014 I2SL Annual Conference will open in January. Watch for an email in the New Year! New I2SL High-Tech Talks will resume in 2014, so stay tuned for details on upcoming topics. If you missed the latest I2SL High-Tech Talk, "Going Beyond BIM with 3D," you can view the recording. I2SL Members can also access the full webinar archive by logging into the Member Portal. The I2SL High-Tech Talks Webinar Series seeks speakers who would like to present an hour-long webinar session in 2014. Please contact I2SL if you are interested in this opportunity.